Here’s my predicament. For whatever reason, my apartment does not recycle paper. I don’t know why this is, but I hate throwing paper away…so I’m always looking for ways to reuse it before having to drive to the recycling center to drop it off. Therefore, I have found tons, and I mean tons, of ways to get rid of old newspaper. Help items like shoes, hats, and purses, retain their shape in storage by stuffing them with old newspapers. Use old newspaper as a paint guard around crafts, window trim, doorframes, and more. You can also cover furnature and other items around your house with newspaper if you’re doing a lot of painting. Add more cushion to your table by putting a few sheets of newspaper between the table and the table cloth. If you’re getting a cold draft under your door, stuff some newspaper under the door to act as a blockade. Use newspaper to dry windows in your home and on your car for a streak free shine. Newspaper is a crafters best friend. It can be used for paper mache, making kites, costumes, wrapping paper, jewelry, and much more. And don’t throw those comics away! They can be a great addition to any craft project, too. If you have a fireplace, newspaper makes great kindling material. Keep a few sheets by the fire in the wintertime to insure a nice cozy fire. Shred newspaper for cheap and environmentally friendly cat litter. Newspaper can also be used to mop up grease, drain fried food, and line your table for a summer seafood feast. Use newspaper as garden mulch or a weed blocker. Dampen 5 or 6 sheets and lay under grass clippings or soil to keep from blowing away. Stuff smelly work boots with newspaper and the odor disappears. Here’s a good one for us Midwest gals…if your car is stuck in the mud or snow, a hefty section of the Sunday edition placed under your wheel should give you enough traction to get out of the rut. This is a tactic we used in my creative writing class quite a bit. Cut out random stories that catch your eye or entertain you in some way. Put them in a folder and randomly pick one out and use it as a writing prompt. Or, along the same lines, cut up random headlines and put the words in a bag. Pull out 10 words and write a story that includes all those words. Grab an orphan sock from your drawer and stuff it with newspaper. Instantly you have a new play toy for your puppy or kitten. 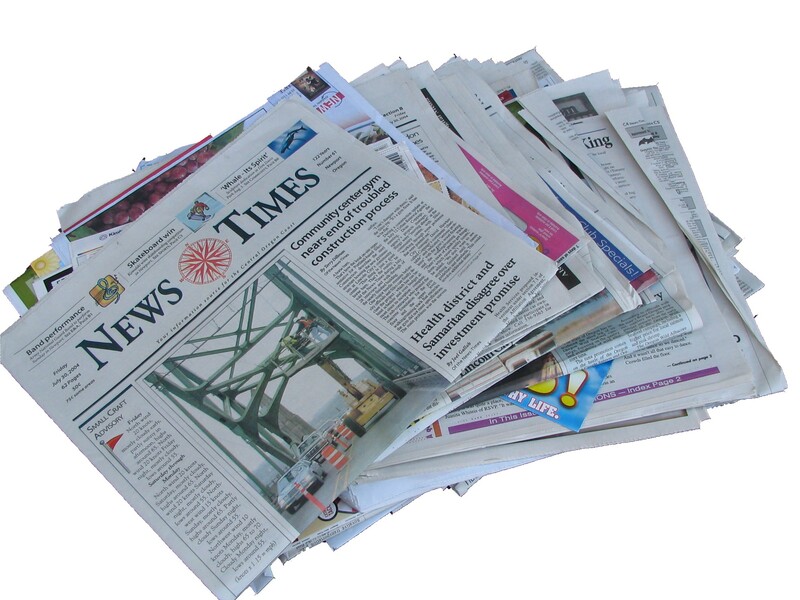 The uses for newspaper are practically endless…so before you toss it in the blue bag, consider what else you can do with yesterday’s old news.